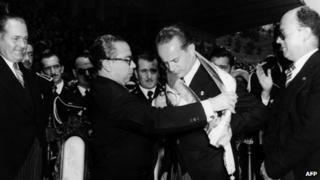 Guatemala's government has apologised to the family of former President Jacobo Arbenz who was toppled in 1954 in a CIA-backed coup. Arbenz, who died in exile in Mexico in 1971, made land reform a centrepiece of his government's policies. His overthrow came at the height of the Cold War as Washington sought to counter what it saw as the Soviet threat in Latin America. The years following the coup saw Guatemala descend into civil war. At a ceremony in Guatemala City, President Alvaro Colom formally apologised for the events of 57 years ago. The move follows an accord reached in May between the family and the government by the Inter-American Commission on Human Rights. Under the settlement, the government recognises that the Guatemalan State failed to protect the human rights of members of the Arbenz family. "Asking forgiveness has historical implications for the country and for Guatemalans' historical memory because (the coup) was when our coutnry's debacle began," Ruth del Valle, head of the presidential commission on human rights told AFP. Jacobo Arbenz, elected in 1951, embarked on a series of social policies, which included trying to enact agrarian reform. For the US government of the time, this fuelled suspicions that Arbenz had communist sympathies. His actions also angered the United Fruit Company, a US multinational with extensive landholdings in Guatemala. In June 1954, in a coup engineered by the CIA, Arbenz was replaced by a military junta led by Col Carlos Castillo. "It was one of the key moments of the Cold War in Latin America," Arturo Taracena, who served on the Guatemalan Historical Clarification Commission, told BBC Mundo. "It was the first time the US intervened in Latin America not directly with its own forces but via a mercernary army." It also marked the start of a long and bloody conflict, according to Nick Cullather, who wrote Secret History: The CIA's Classified Account of its Operations in Guatemala, 1952-1954. "The US replaced a democratic and relatively popular government with a tremendously unpopular dictator," Mr Cullather told BBC Mundo. "That triggered a massive wave of repression." Although the civil war did not fully break out until 1960, many believe that the origin of political violence in Guatemala lies in the abrupt termination of Arbenz's time in office. "Without doubt, it set in chain a series of events that created a violent society in Guatemala which continues to this day," said Mr Cullather. More than 200,000 people - most of them civilians - were killed or disappeared during the civil war that finally ended in 1996.